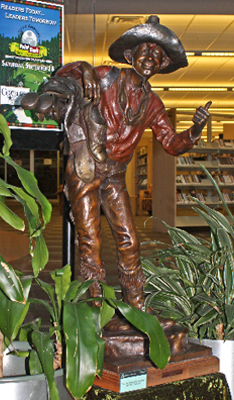 "Bronc Buster's Holiday" Large Version is shown on display at the Lewisville, TX, Public Library. Photograph by Elizabeth Loggins. Detail of "Bronc Buster's Holiday" Large Version by Bill Bond. Photograph by Elizabeth Loggins. 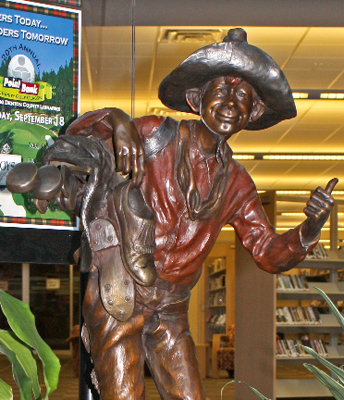 A small cowboy raises his thumb to hitch a ride to a golf game. "Bronc Buster's Holiday" Large Version was recently displayed at the Lewisville, TX, Public Library to promote the 20th Annual POINTBank Charity Golf Classic. Proceeds from this yearly event benefit Denton County Libraries.